Shopping for Final Fantasy Action Figures? Control Chaos and destroy Hojo and Omega! Vincent Valentine as he appeared in Dirge of Cerberus: Final Fantasy VII. This Play Arts Kai action figure stands almost 11-inches tall! Includes Vincent's Cerberus pistol, the Hydra rifle, and interchangeable hands. As a result of scientific experimentation forced on him, Vincent Valentine possesses the powers of a monster. 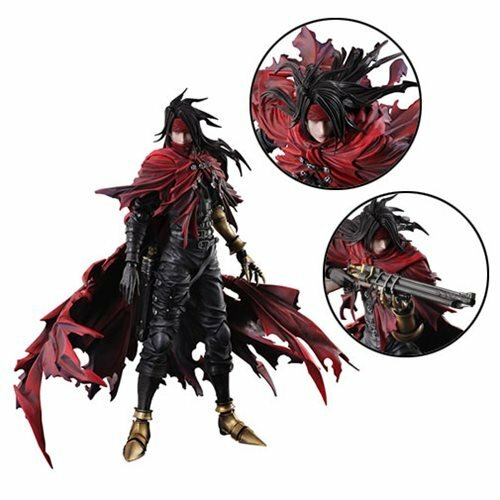 This 10 9/10-inch tall PVC Final Fantasy Dirge of Cerberus Vincent Valentine Play Arts Kai Action Figure inspired by his appearance in Dirge of Cerberus: Final Fantasy VII, is crafted to highlight his ominous aura. The uniquely shaped cape utilizes a bold contrast of the shadows and changes in coloration, and the elaborate design of the figure draws out a presence that overwhelms all who set eyes upon it! Ages 15 and up. Soft materials are used for articulated parts such as his shoulders and chest for a wide range of motion, and ratcheted jointing in his cape and hair expand the collector's posing options. The weapons that come with this amazing figure are Vincent's beloved triple-barrel pistol, Cerberus, and the Hydra rifle. Cerberus can be held or holstered at his side. Vincent also includes interchangeable hand parts and a display stand.